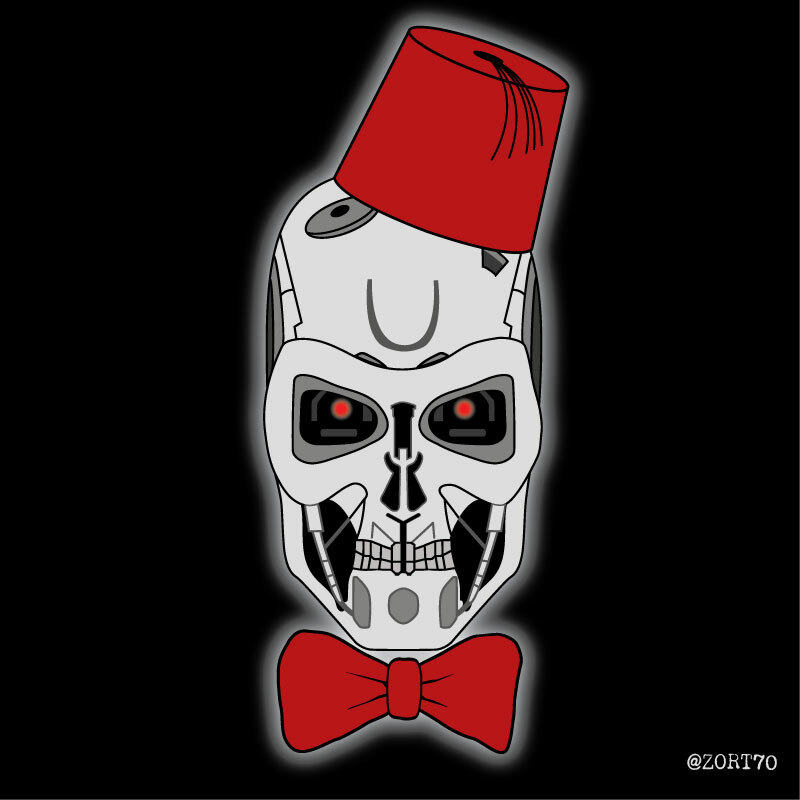 After watching the trailer for the next series of Doctor Who I had this t-shirt idea. It seems that Nardole is around for a little while and as he is well versed in TARDIS operation this seemed appropriate. 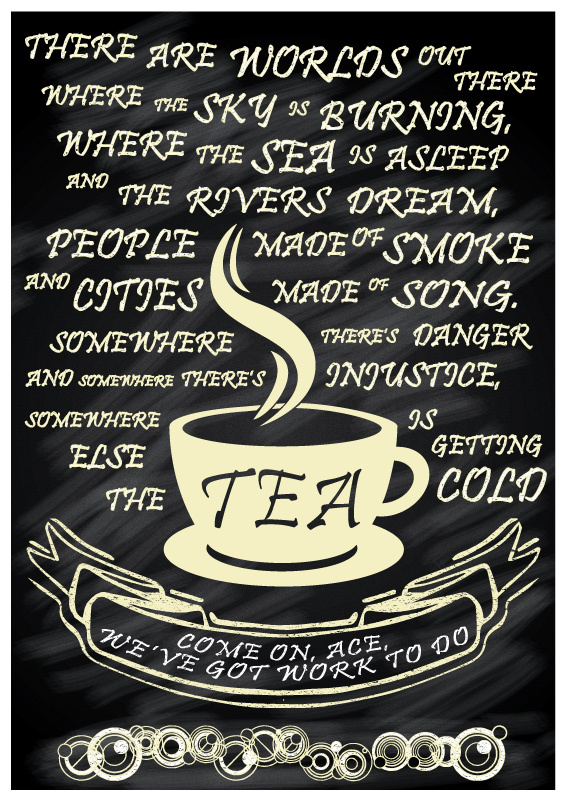 I have uploaded it to Redbubble if you like it. We all want to go to San Diego Comic Con right ? At least the geeks that I know do, but what would it be like if you were featured at SDCC as an artist ? I am about to find out ! BBC America put out a call for people to submit fan art from the most recent series / season of Doctor Who, I decided to update my Siege of The TARDIS poster to make it a little more complete, with the names of the cast and crew involved and make the title stand out a little more. What you see to the left is the end result, and this is what I submitted. To my astonishment a few weeks later I received an email to say they had selected it for display at the BBC America booth at the SDCC event. I am still buzzing with the news that they wanted to feature it ! 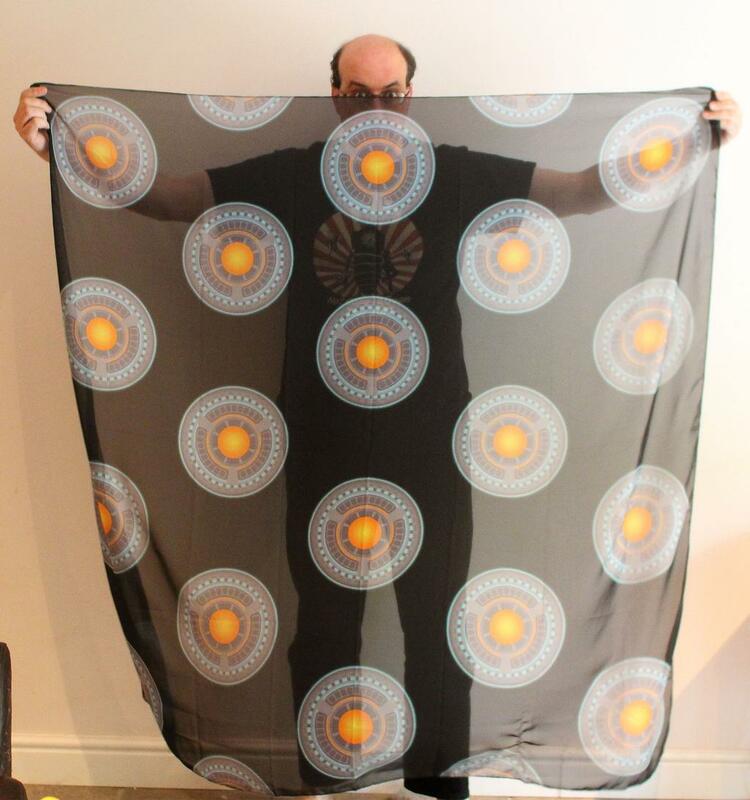 As this is a special occasion I am going to have a little competition, where if you are at SDCC you can win one of my "Round Things" scarves. I will draw a random person from all the entries the Friday after SDCC finishes and they will be the winner, I'll also have a couple of small prizes for other entrants. If you can't get to SDCC send me a picture of something you have bought from one of my online shops or from a limited edition t-shirt sale and I can send some other small prizes out. 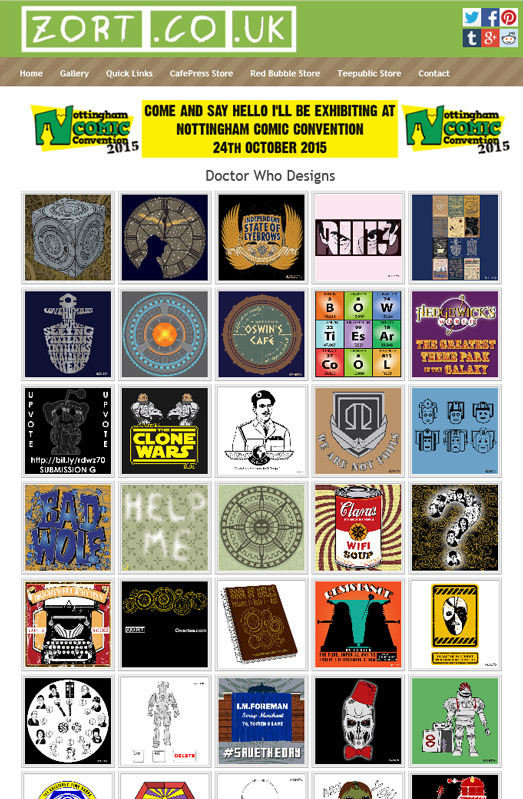 Hot on the heels of my all purpose designs gallery, I thought I'd create a Doctor Who specific version. Most items have a link to a sale page or an article on this website about the design. Although not everything is available and not everything has been documented here (yet). A little while ago I saw that the Doctor Who subreddit were having a competition so I thought I'd have a go. 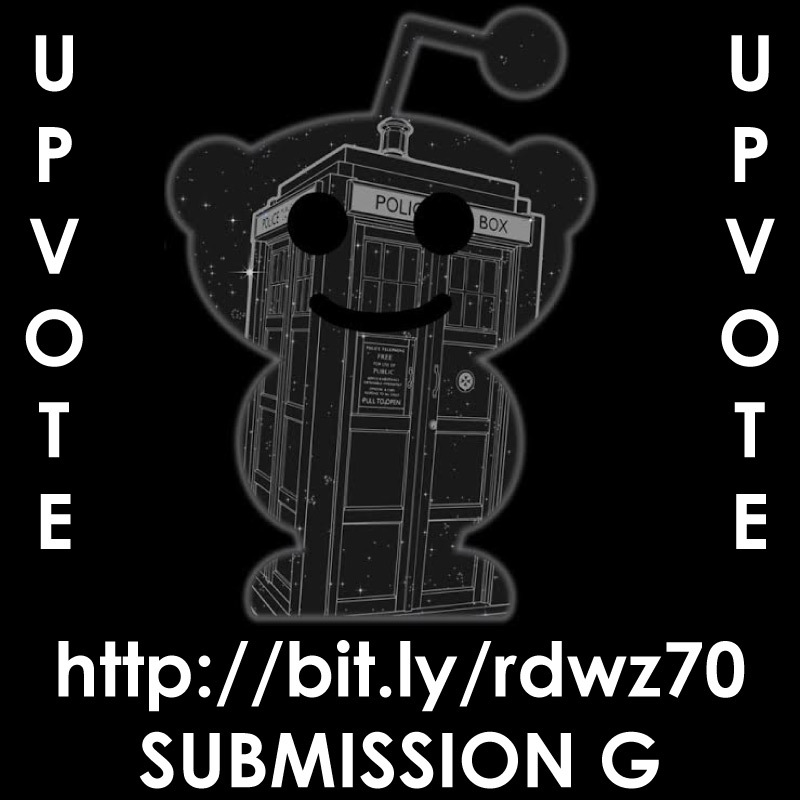 The competition is to design a t-shirt for the r/DoctorWho subreddit that will be sold in aid of Doctors Without Borders. 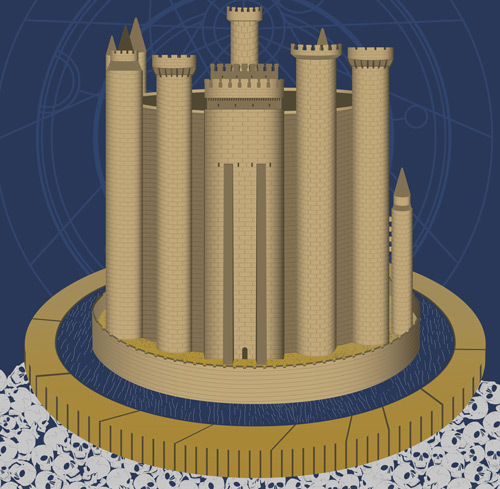 So if you like my design or want to see what other designers have done, visit the competition page and upvote at least one of the designs to show support. There have been some fantastic moments in this series, and some quite frankly dodgy plot holes and pseudo science. I know it is Science Fiction but without a decent grounding in the science part the fiction part quite often fails. 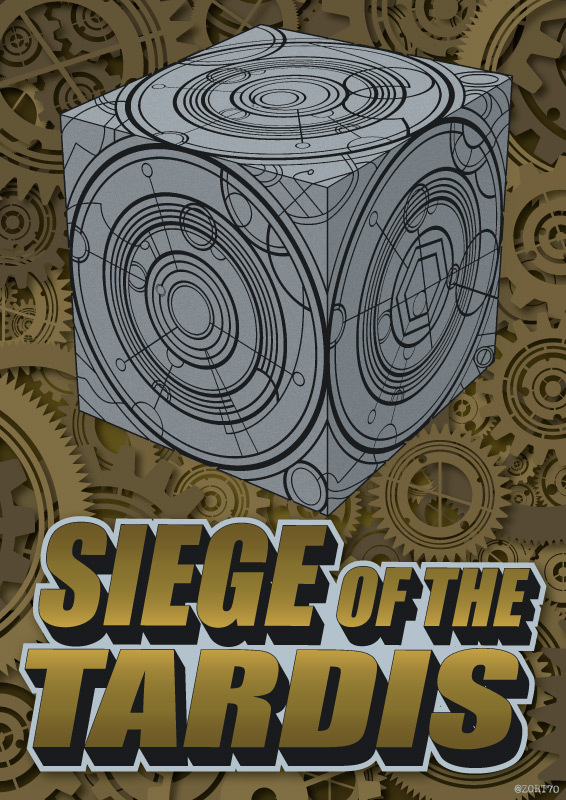 Anyway mini rant over, I did love the new siege mode TARDIS and wanted to try and create something featuring it, so I came up with this poster idea, sort of inspired by a cheap 80's straight to video movie. 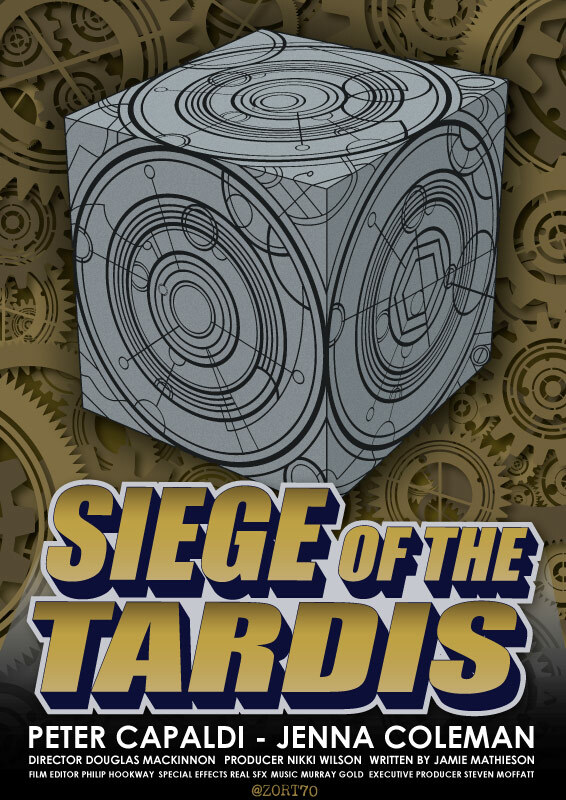 Featuring the siege mode TARDIS and a background of cogs taken from the new opening credits. 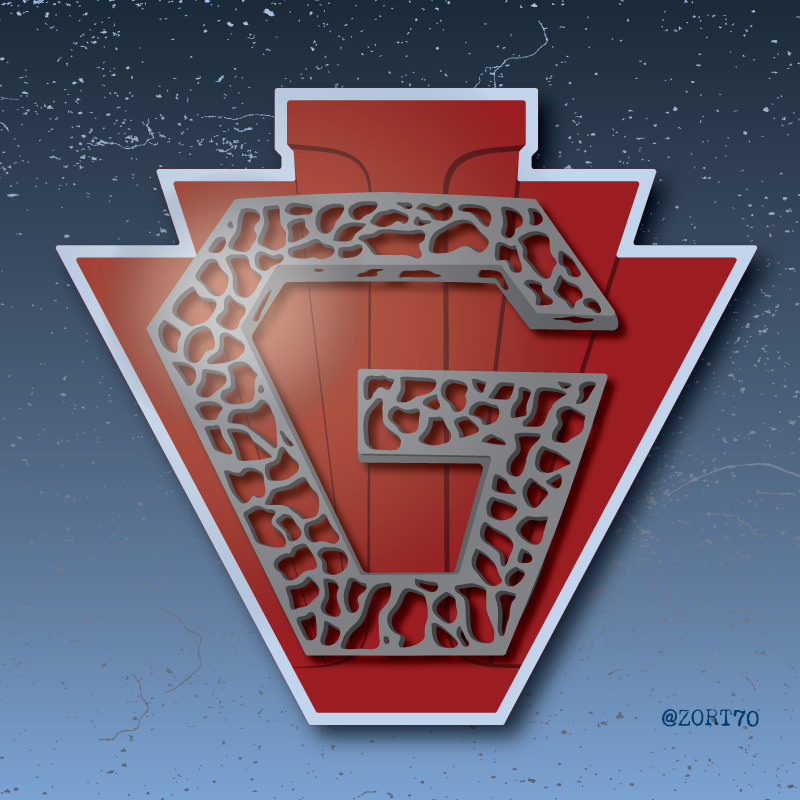 I also created this icon version of the design if you want to use it on social media, if you use it just tell people where you got it. 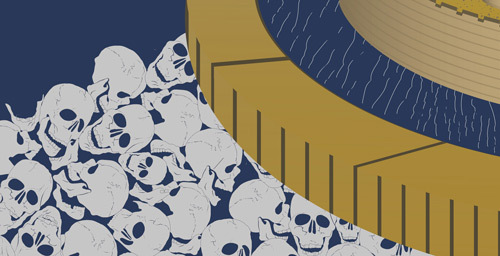 Click on both the images to get the full size versions. The new series of Doctor Who has started ! With a new Doctor ! I'm undecided on the first episode whether I'm fully on board the Capaldi train or not, but the next few weeks will be interesting. During this first episode there was a quote by the 1st doctor about his eyebrows, so in the spirit of my Doctor Who quotes project I thought I would create something to mark the occasion. If you don't read Latin the motto is "Attack with the Eyebrows"
After watching this episode a couple of times, I'm convinced it tried to cram a years worth of story into 60 minutes. However I don't think it is totally without merit and gave us some great moments if not a cohesive and complete story. 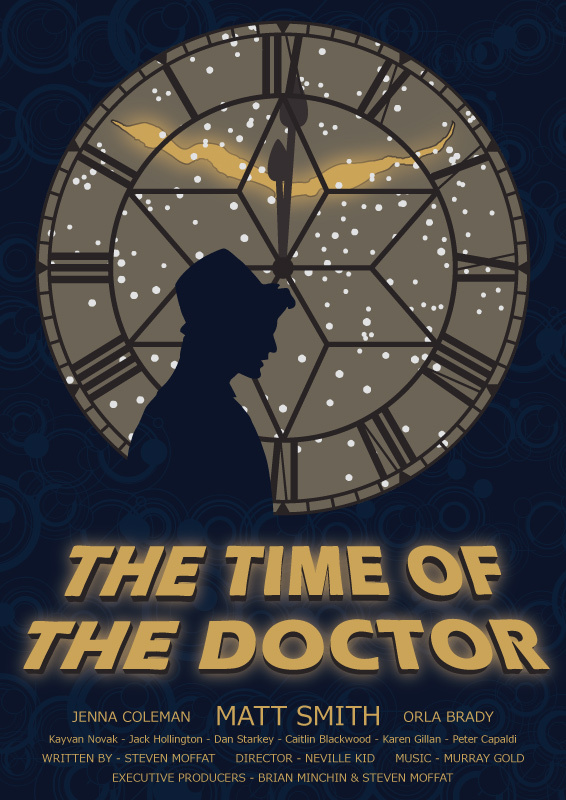 Anyway since watching it, and actually before when I saw the promo pictures, I thought about a poster incorporating the clock face from the tower. In the end it ended up by being the view from inside the tower looking out through the snow of Christmas at the crack in the universe. 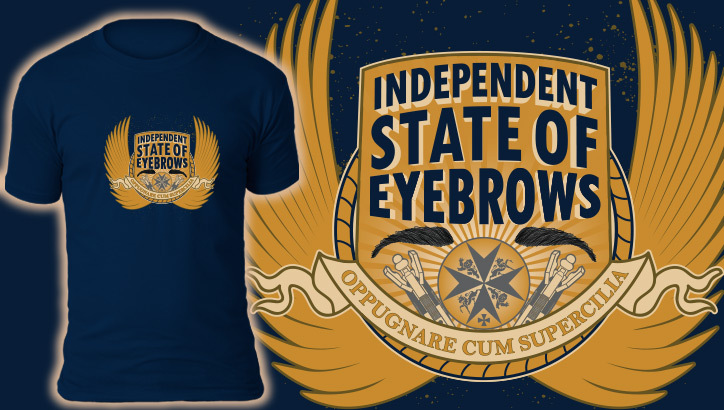 This was just for fun and isn't available anywhere, but I have submitted a t-shirt version to TeeBusters so if you have a moment please vote. The War Doctor Quote was something I wanted to do to complete the set of known doctors, however the 50th anniversary gave us a very brief glimpse of the next doctor. Not strictly a quote I know but I wanted to see if I could do something even if we just saw his eyebrows ! 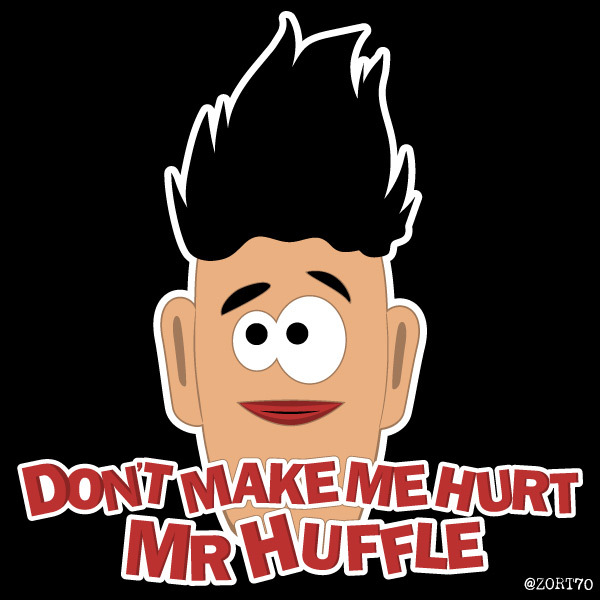 So I thought why not put his eyebrows behind the words that introduced him. 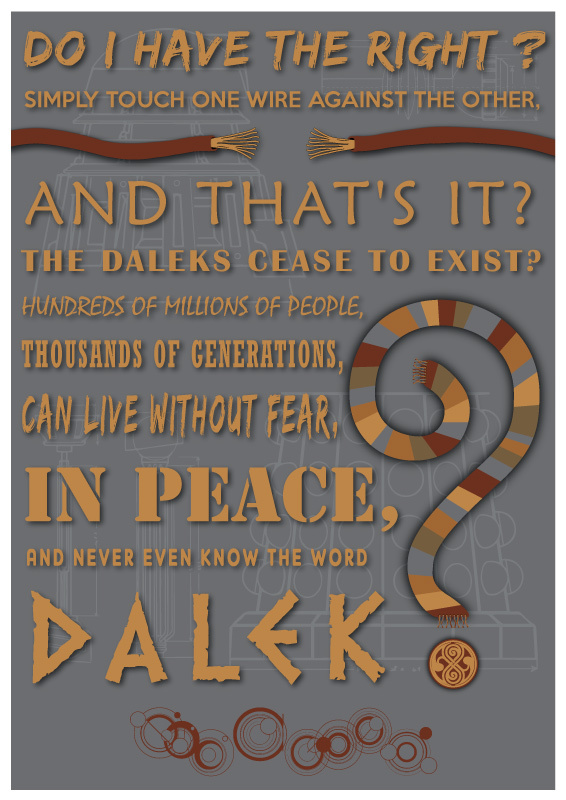 When I saw the 50th anniversary episode I knew I had to create one more quote, and as there was a fairly limited amount of words to use, this seemd like the most appropriate. 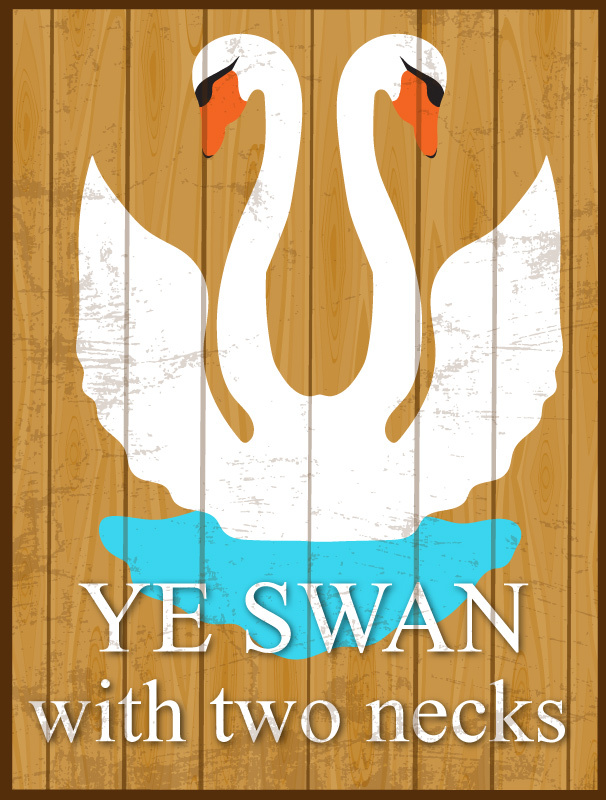 I actually created it a couple of hours after the broadcast, which has to be the fastest turnaround from a doctor appearing to quote poster ever ! As you can hopefully see there is the UNIT logo, some Gallifreyan symbols, which were actually used most in the closing credits, and the three Doctors are represented, Bow Tie, Trainers and a quick sketch of the War Doctor. Here they are, the full 12 quotes, and if you have been following along all year you will know why there are 12 not 11. 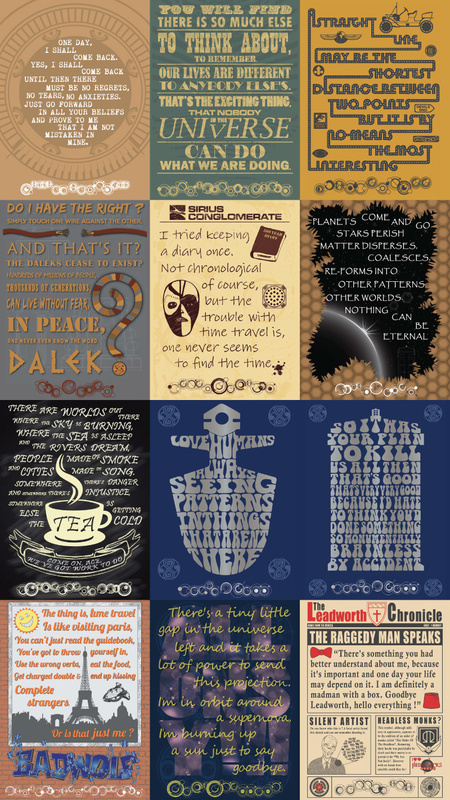 Click on the image for a larger version or see all the quotes, with more details on their creation and inspiration, on the main DW Quotes page. Thanks to everyone that requested I created printed versions of these throughout the year, as you know I created a limited edition set of 12 quote cards that is now available for purchase in my online shop, there are only 50 sets available, so get yours while you can. So this is it the final quote in my year long project. It is the quote you might expect from doctor 11, but people usually miss off the last part. Which led me onto thinking how would the Leadworth Chronical report all of this. So I decided to create the front page of an edition of the newspaper, and as you can see in this edition they have been following the Doctor quite a bit. 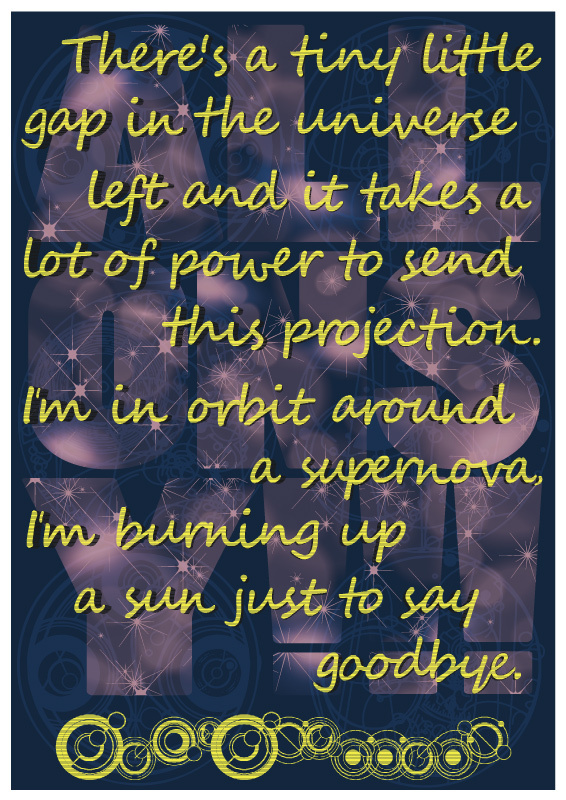 This concludes the set, but I might just create another from the 50th anniversary if there is something quote worthy, and I'm guessing it will be quotes packed ! Don't forget the whole set of 12 cards is available for purchase in my online shop, there are only 50 sets available, so get yours while you can. The moment has finally arrived, I had no idea how the quotes would be received when I started creating them but it seems lots of you love them. The launch of my brand new limited edition online shop now has the quote cards for sale. 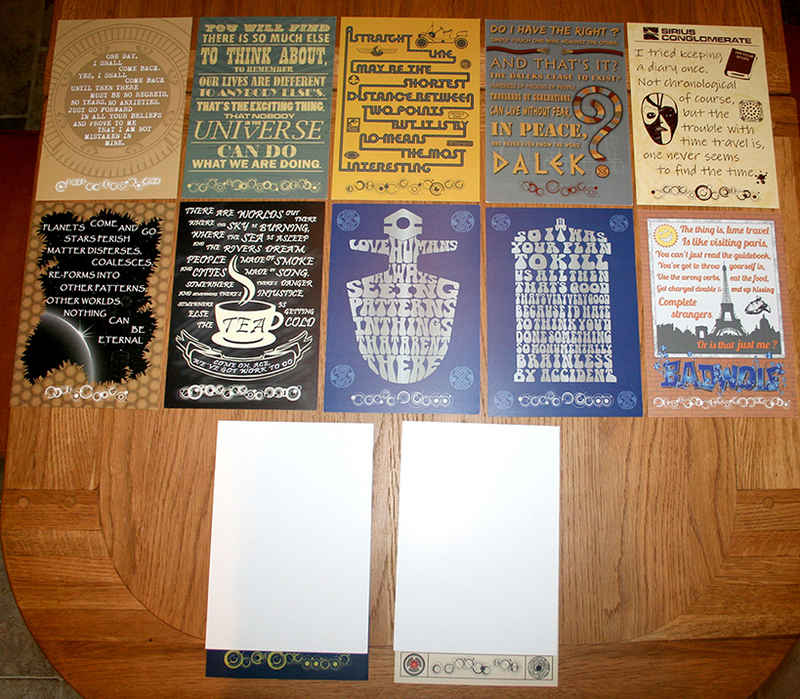 As mentioned before there are 12 UK A5 sized cards featuring all of the quotes. As it's the 50th anniversary there is a limit of 50 packs being made available to purchase, when they are gone they won't be reprinted. There is a small difference to the versions you see on this website, in that I have made the cards borderless, so you get a few more mm of art per card ! If you are wondering why the 11th Doctor quote is blanked out it's because I haven't officially posted about this one yet as it isn't November ! 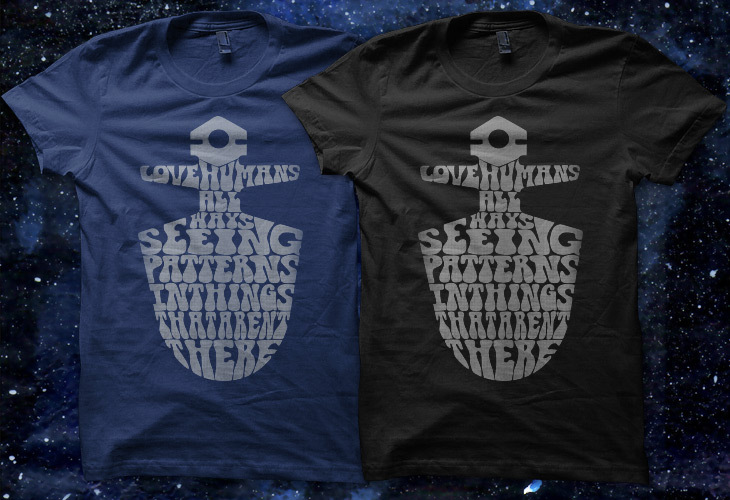 You can see the 11th Doctor quote but only by going to the shop website. This one is sort of two quotes in 1, the main quote of course being about Rose being left in another dimension. 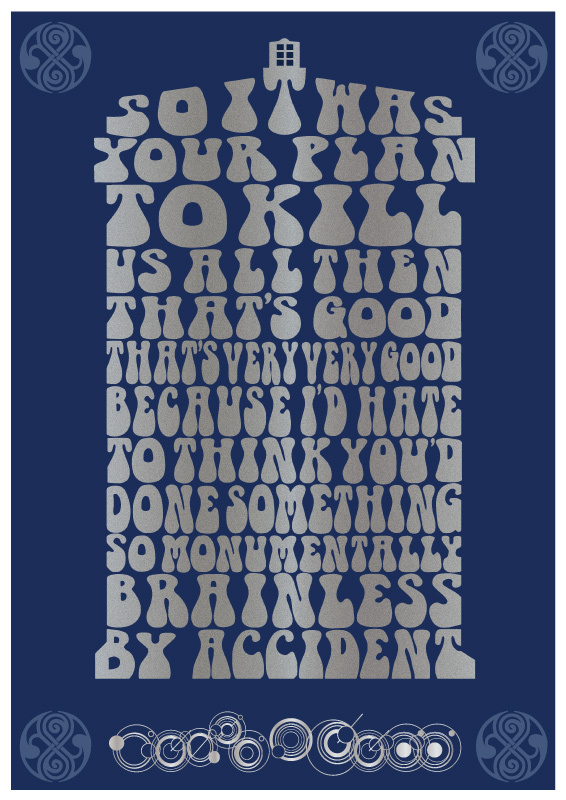 The second in a sort of starry background universe is the 10th's favourite phrase ALLONSY! If you are following the quotes project you will probably know that I have printed 50 sets of the quotes and they will be available for sale, that date is nearly upon us and I will post more details about how to purchase them very very soon. 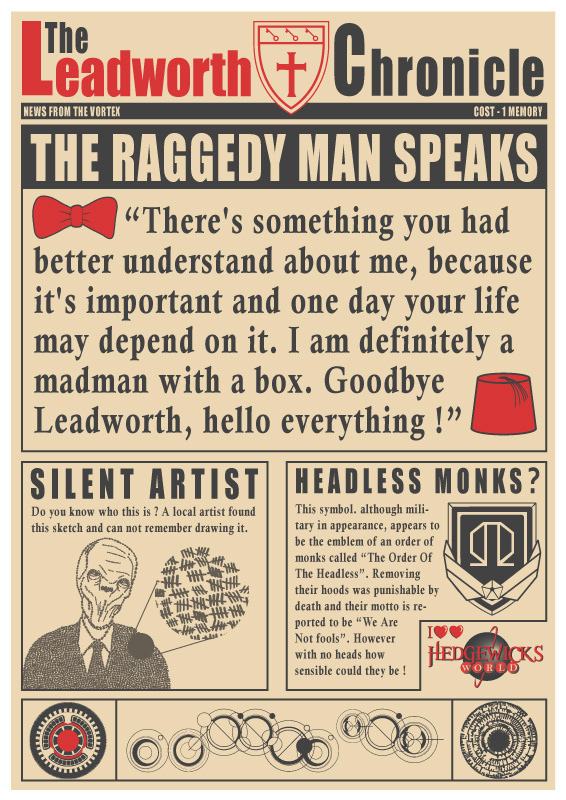 Keep checking the main Doctor Who Quotes Project Page for details. Since I started the quote project people have asked whether they will be for sale and at the start I had no illusions that people would do that ! So with me going to the Nerdfest Comic Con in Nottingham I thought that now would be the right time to see if I could find some way to let people purchase them. 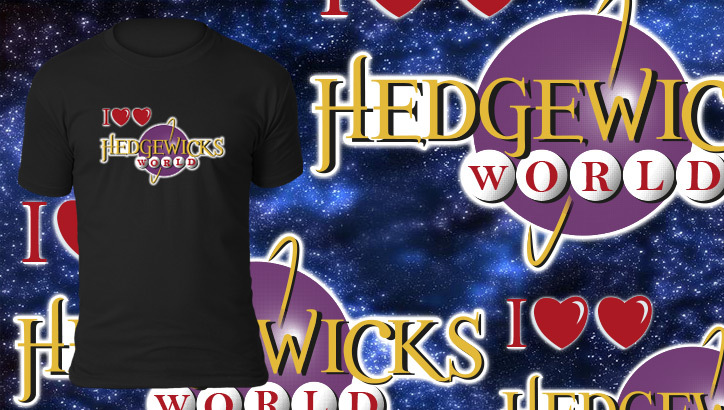 I looked at quite a few options and yes I could have just put them all on Cafepress or Redbubble individually, but I really wanted to keep the collection together and have some sort of control over how they were printed. After a lot of searching and weighing up options I found a company that would print them in bulk on A5 cards, the result of which you can see in the picture. 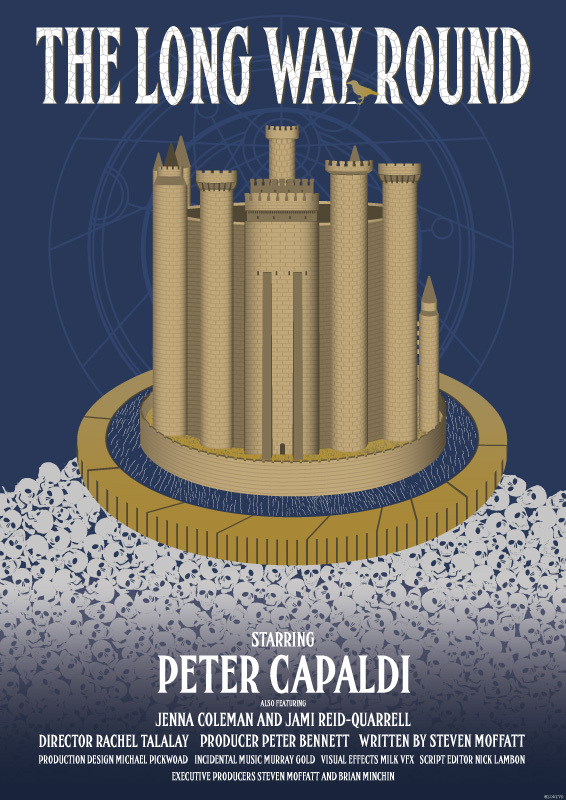 The final "product" will be a set of 12 cards, 11 doctor quotes, plus the 8th Doctor Big Finish quote as a bonus, and there will only be 50 sets printed and sold. They will be available first at Nerdfest in Nottingham, and assuming they don't sell out there they will be sold online shortly afterwards. Follow me on Twitter - @Zort70 - to get the latest information on the sets. One last thing, there will be some special sets in the 50 with a little extra, but I'll let you discover that for yourselves. The ninth in the Doctor Who quotes project was a slightly tricky one, not because of the quote but because of how to present it. 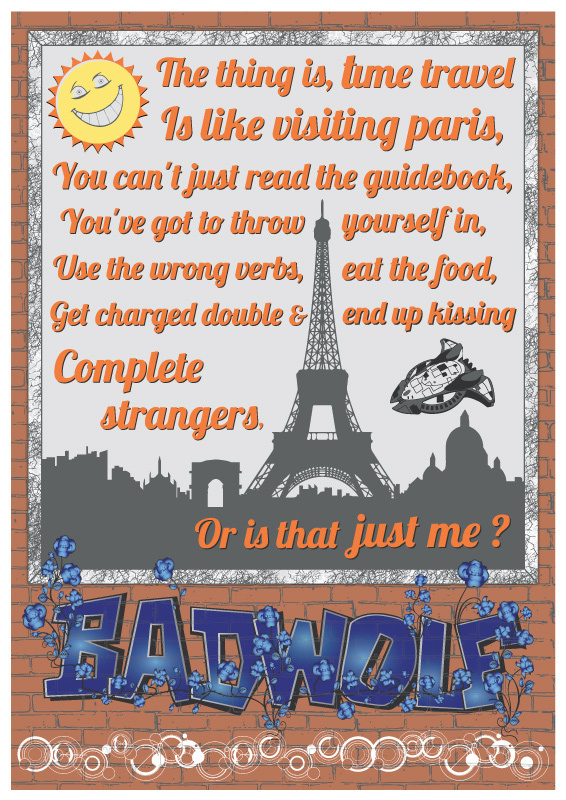 I knew I wanted to include the Bad Wolf Graffiti element so a wall was going to be the background, but I didn't want to have the quote as graffiti. So I thought why not present it as an advert, and the idea was born. 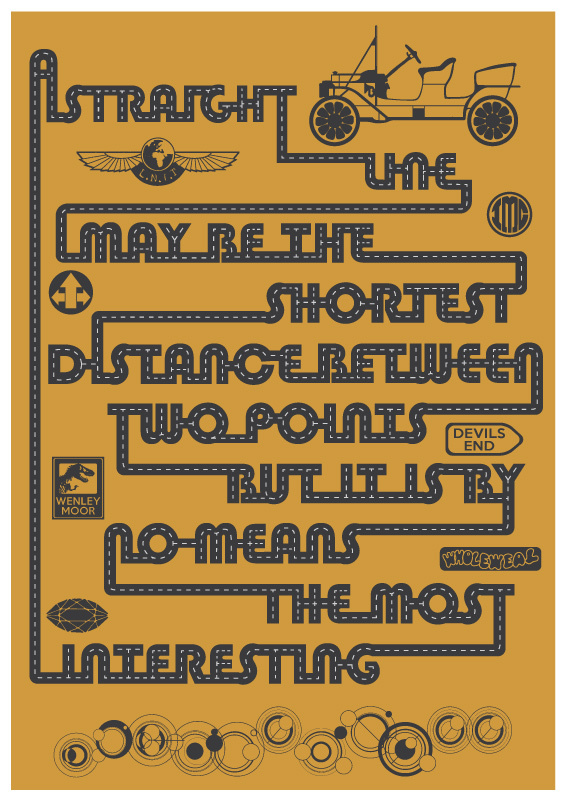 Unfortunately I found out after creating this that a world famous poster artist had a similar idea for one of his projects, but sometimes worlds clash and there is nothing you can do. 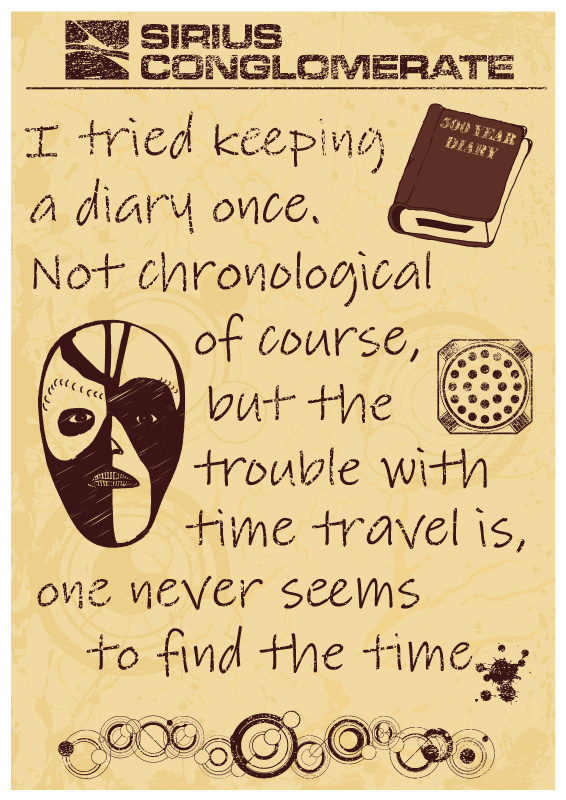 As to the quote itself, I love the metaphor of time travel being like visiting Paris, it shows the ninth doctor had the traditional impish sense of humour behind the rugged exterior. Oh yes, you might also see a sneaky Slitheen cruiser thrown in for good measure. As it's August already (!) 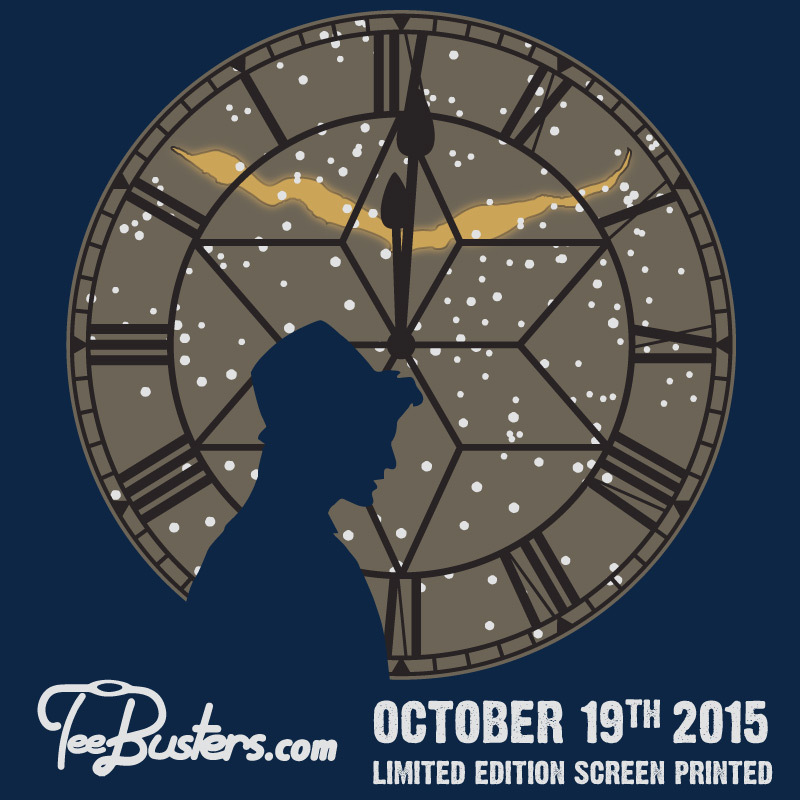 it must be time for the Eighth Doctor Who Quote Poster. Paul McGann only had a few fleeting moments on screen compared to the others, but made quite an impact, I think this quote has to be my favourite from the TV movie. Being human of course I hope you recognise the pattern of the TARDIS key that the Eighth Doctor used and others used at various points in his history. 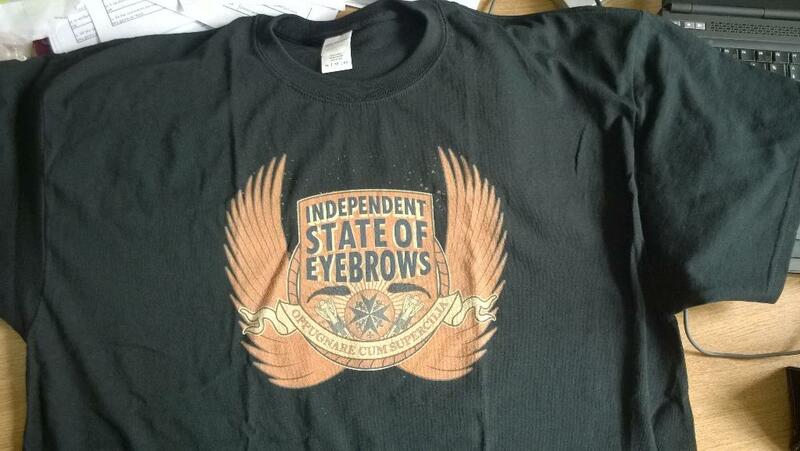 I also thought the key design would make an interesting t-shirt so I have uploaded it to a few daily print sites. Now when choosing a quote for Doctor Eight I had a choice to make, do I stay with the on screen appearance or do I use one from the huge body of work that Paul has made with the Big Finish audios ? I realised that the only option was to break my rule of one quote per Doctor and recognise that huge contribution to the Doctor Who universe. So presented exclusively here is a bonus Big Finish quote from the Eighth doctor. The grammar police have been out in force and given me a talking to ! 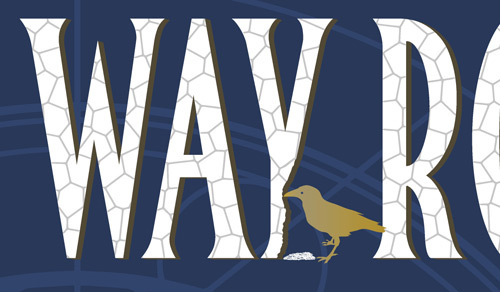 I was aware of the deliberate mistake in the original, however I decided to use "all ways" instead of "always" as it was neater and fitted the design in a pleasing manner. However it seems that may have been too radical for some people and I decided to try it the "correct" way and see how different it was. It may be correct but I'm still not convinced it is better, but I am going to let you all decide, let me know on which ever social media website takes your fancy and if the posters get printed I will make a final decision based on feedback received. 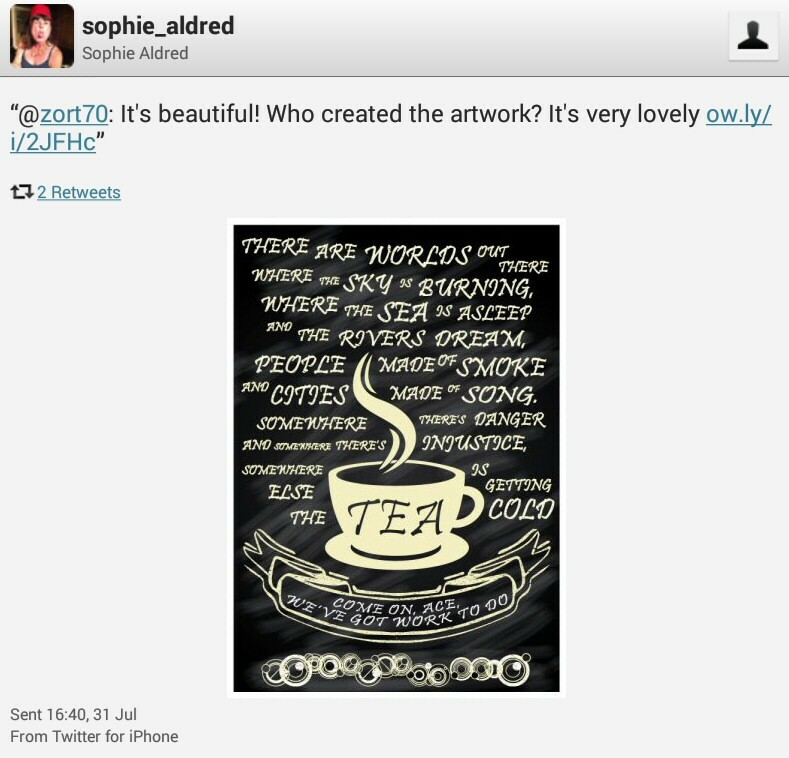 The very lovely Sophie Aldred saw the Seventh Doctor quote and sent some very kind words via twitter. Previously only available in the fan made Celebrate Regenerate book, I now present the Seventh Doctor quote here for the first time. 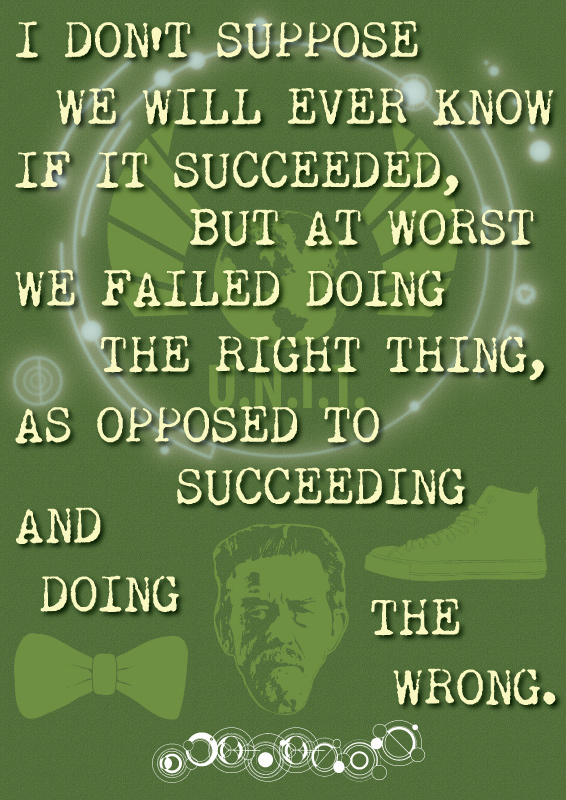 In the interest of full disclosure, this was the first quote I created, last year I played around with this one and then that led to the idea of creating a quote poster for all the doctors, so the seventh was my first so to speak. This is Celebrate Regenerate, a fan made, not for profit book celebrating all 50 years of Doctor Who. Articles about all the stories, interviews with the past and present of DW and lots of great art. 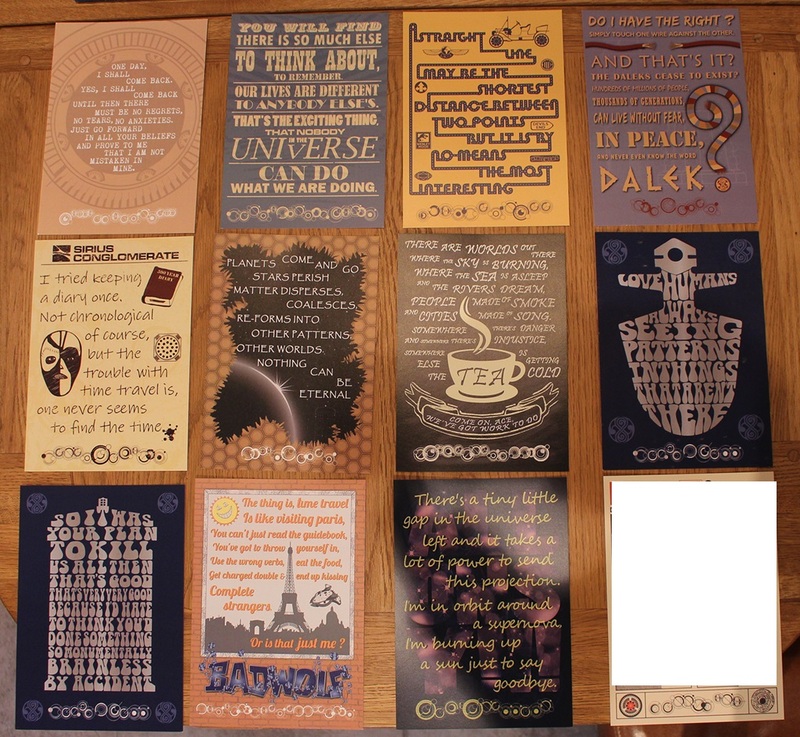 The book features all the current DW quote posters and also the debut of the 7th doctor Quote poster. So go have a look, it is free to download or you can have a printed version created with £1 for each one sold going to Children in Need. 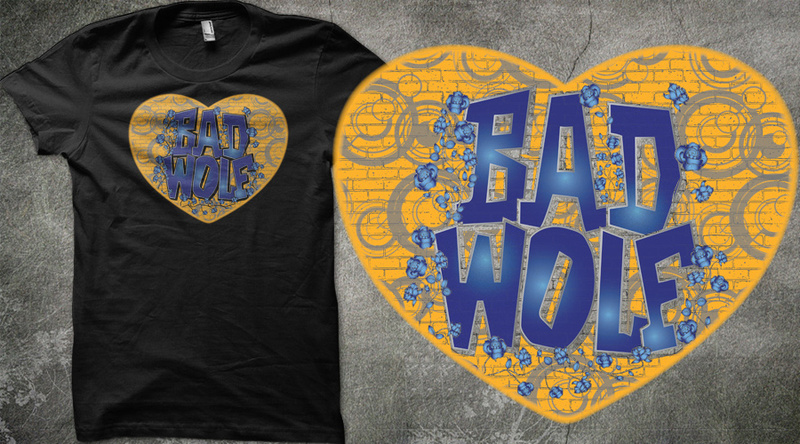 Love the Bad Wolf ? Then why not show it. 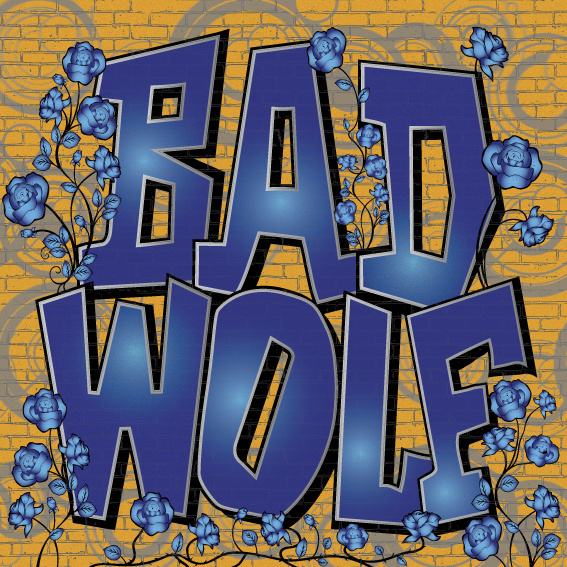 I read about the fans attempt to get Bad Wolf in as many places as possible on one day and thought I'd have a go at creating some Bad Wolf related graffiti art that might help spread the word. 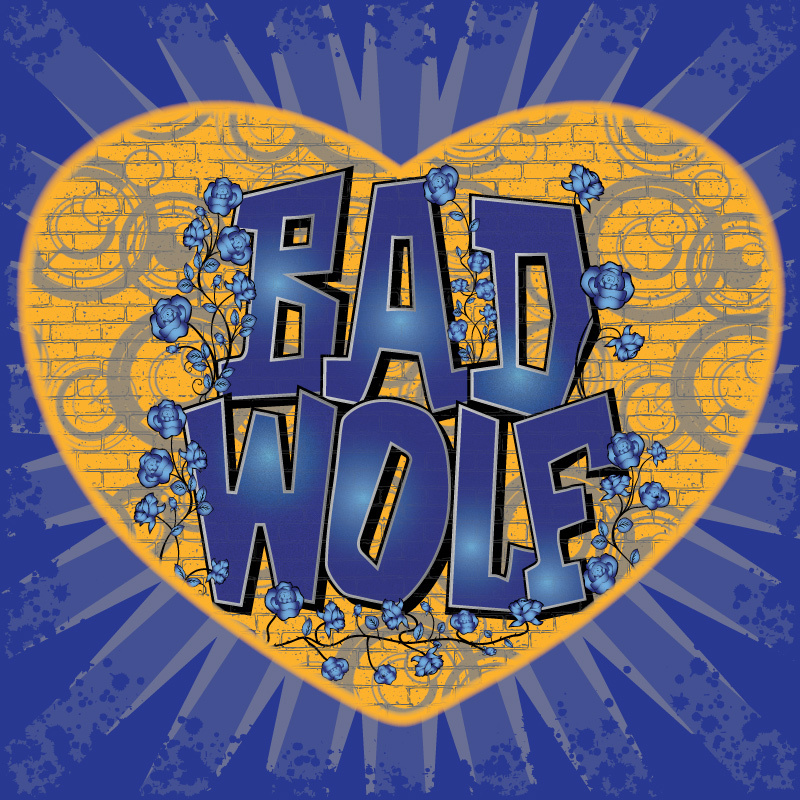 Then I thought why not show some love for the Bad Wolf and added a heart around the design to give it a more focused look. 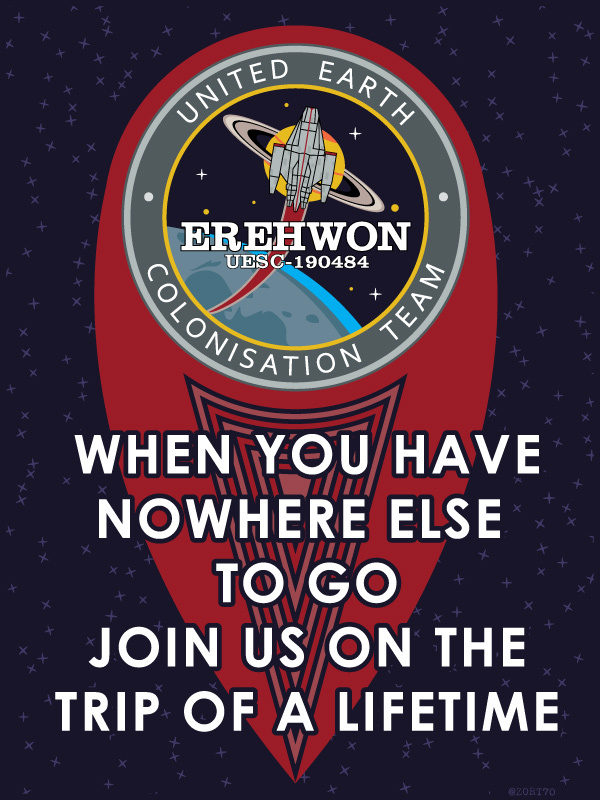 Click on either of the two images to show the larger size and feel free to use them on your preferred social media or other website, or simply print a copy off and pin it up at home / work / the nearest random place ! A quote where the Sixth doctor waxes lyrical to Peri abut the nature of the universe and about how life goes on no matter what happens to us. 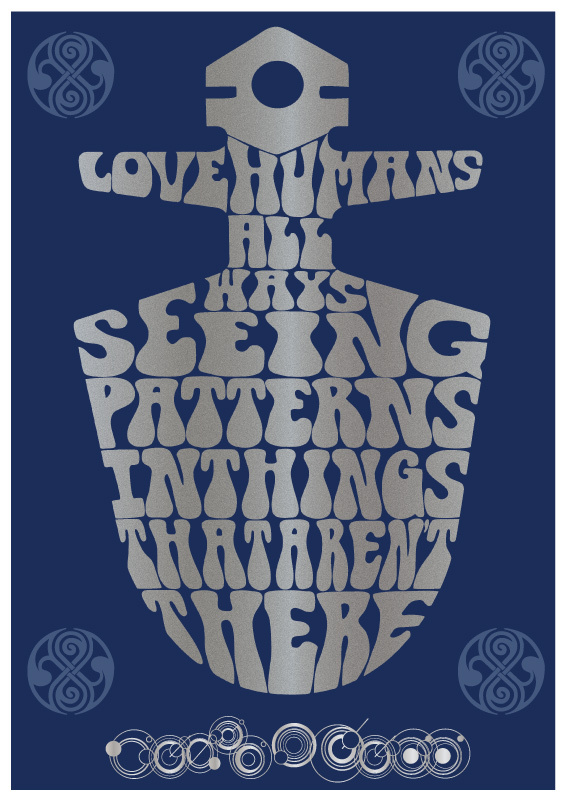 I wanted to use a hexagonal TARDIS style roundel for this poster as it is the Sixth Doctor, in fact that came first before the quote. 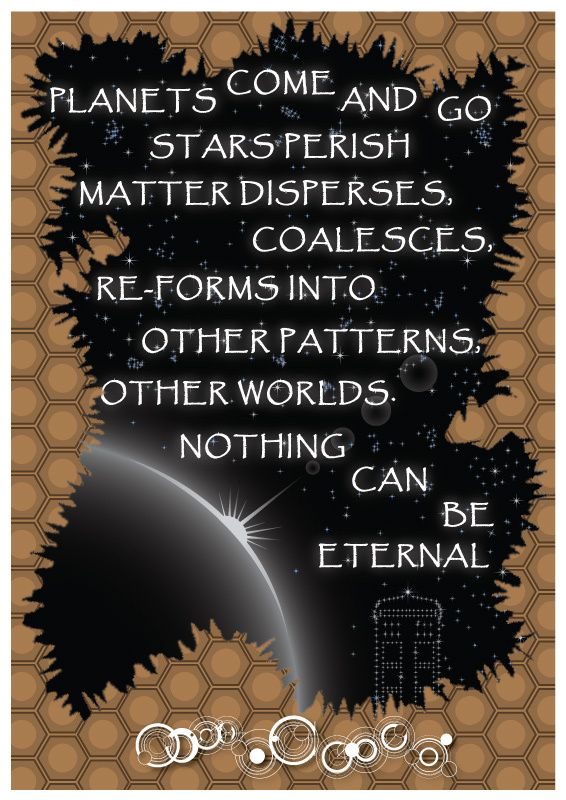 Once I had found a quote I decided it had to be floating in space so I imagined a scenario where the TARDIS had a small breach in the wall and the vastness of space was shining through. 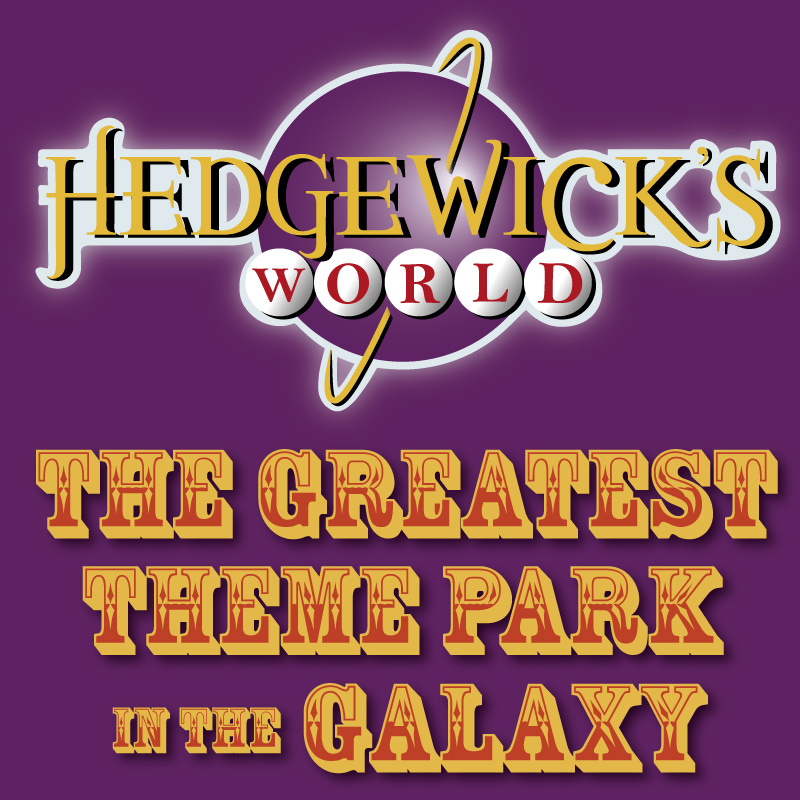 When is your next trip to Hedgewick's World, the greatest theme park in the galaxy ! This is based on some early promotional material that has been posted online, so may not be 100% right, but I thought I'd have a go anyway. The quote and doodles are written on an old piece of headed notepaper from the Sirius Conglomerate which is the slightly less than legitimate company featured in the episode the quote is from. Featuring the 500 year diary that the Doctor is referring to and a sketch of Sharaz Jek and his android controlling belt buckle. Since the new TARDIS interior made it's debut at Christmas I had noticed the new multicoloured roundels that are dotted all over the console room. It wasn't until Journey To The Centre Of The TARDIS that we got a decent look at them so I thought I would have a go at creating my version, and here it is. 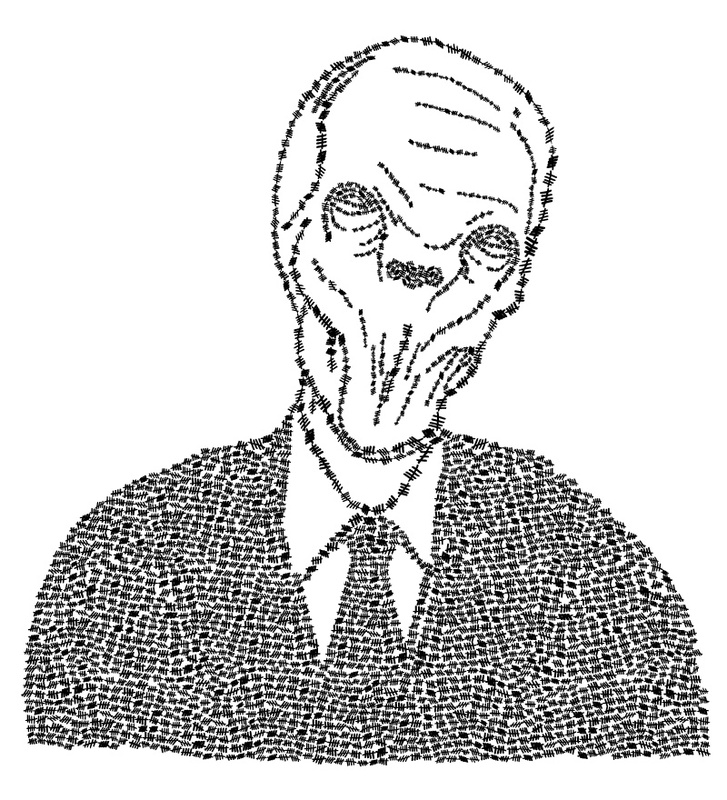 A quick Twitter icon in advance of this week's episode of Doctor Who. 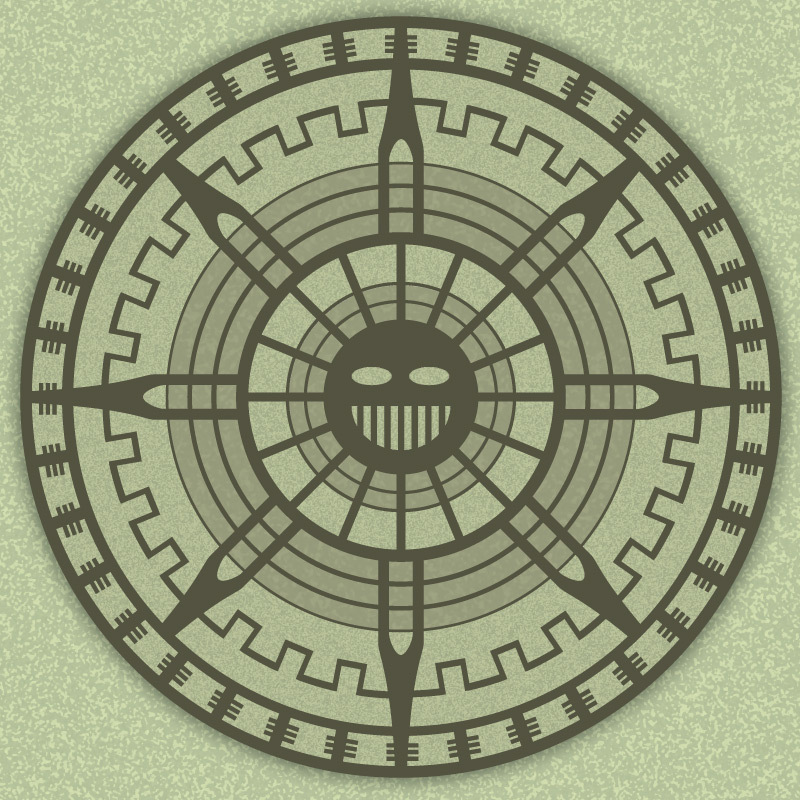 From episode 2 of the second half of new Doctor Who's seventh series (yes it's confusing isn't it) I saw this symbol and thought I would have a go at recreating it. 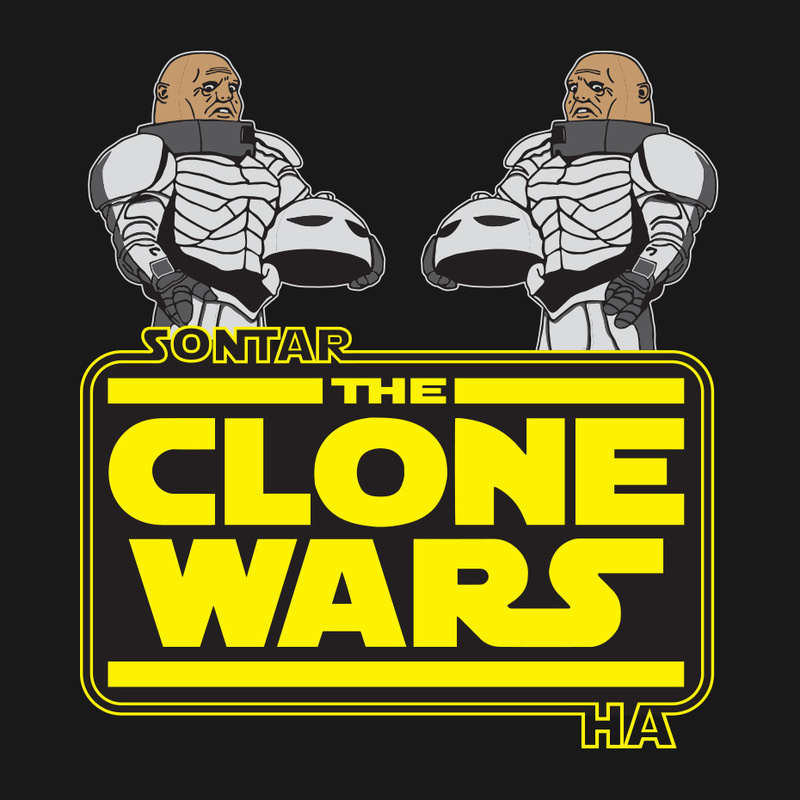 The one on the right was created first based on a very blurry promotional image, the one on the left was updated after the episode had aired. Howver even within the episode there seem to be several variations so there isn't one version that will be correct. 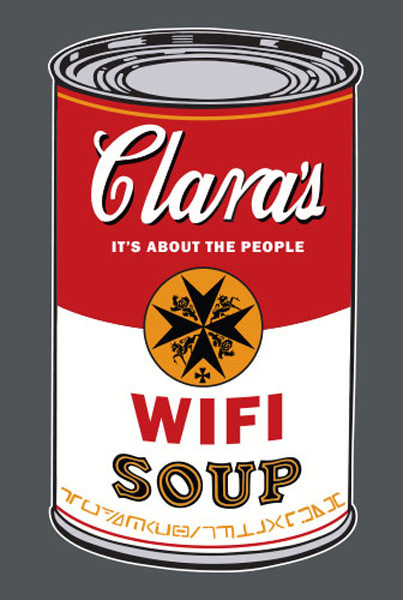 Clara's WiFi Soup, it's all about the people ! This is now available in my Redbubble store on t-shirts, Pillows, iPad cases, etc. 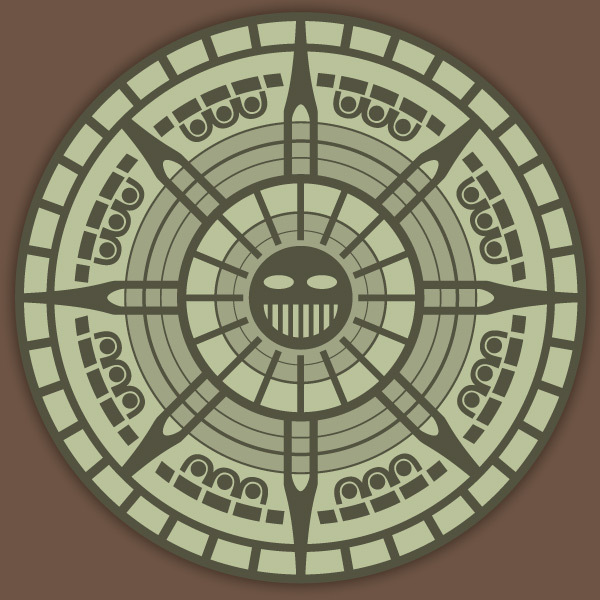 If you like the design then here is an icon version for you to use wherever you want to. I know it's not quite April yet, but as there is a new episode of Doctor Who tonight this seemed like the perfect time to present the fourth doctor's quote. You won't know how difficult it was to choose just one quote for the fourth doc, but that was my criteria I set myself at the start and that's what I'm sticking with. I did bend one of my own criteria and have used more colours than I was going to but with that scarf I think it was absolutely necessary ! The quote is, in my view, the ultimate dilemma for a time traveller, do I create a paradox and destroy what I know, or do I leave the causality of time and space alone as good can come from evil. Apart from the quote typography, I wanted to include Bessie, the third Doctor's "borrowed" earthly method of transport, and after creating the image of Bessie that's where the road idea popped into my mind. Not an epic world saving line from The Doctor, but one of my favourite quotes that can apply to any circumstance, earthly or otherwise. For now I'll leave you all to work out what the various other symbols mean, I might run a competition at some point so start working on them.